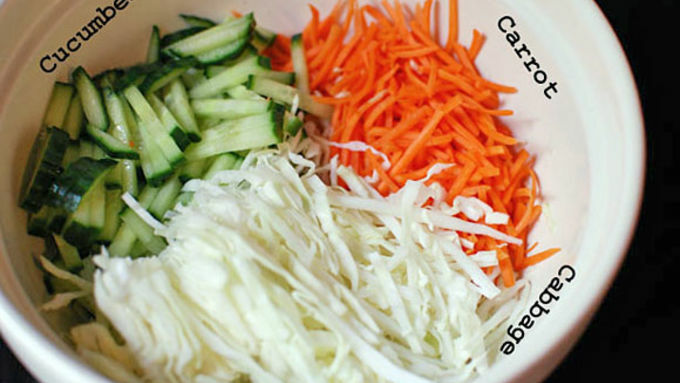 Shred the cabbage, cucumber, and carrot and place in a bowl. Add the minced garlic, grated ginger, and gochujang and stir. Bring the vinegar to a boil and pour over veggies. Allow to sit for 2 hours before serving. Stir occasionally. Meanwhile, mix the meatball ingredients well. Be sure to dice the garlic and scallions nice and small, and smash the tofu in your fingers so there aren't many visible chunks. 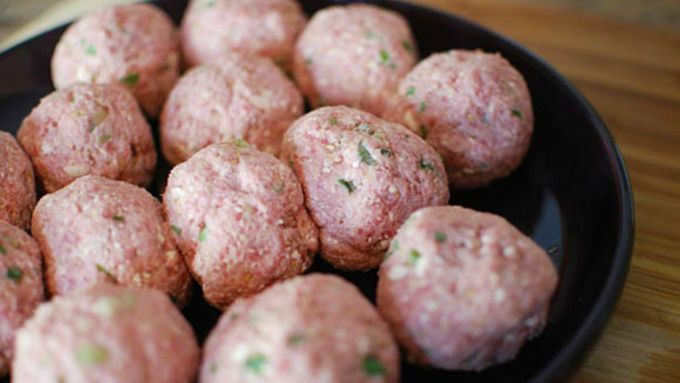 Form into 15 meatballs. 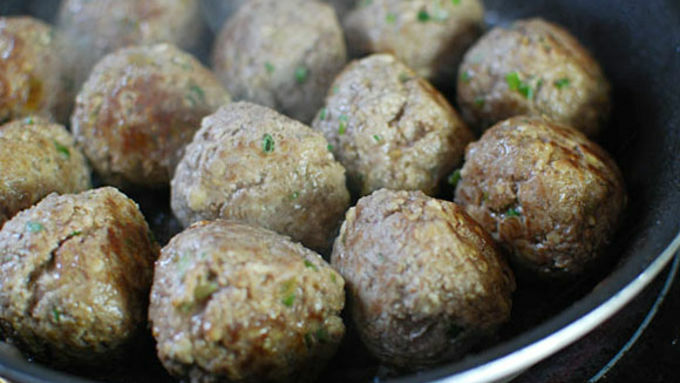 In a small amount of oil, cook the meatballs to brown on all sides. Meanwhile, mix the sauce ingredients in a bowl. When the meatballs are nicely browned, drain out most of the fat from the pan. Pour in the sauce and mix well. Simmer on low until the meatballs are nicely coated with a sticky sauce and fully cooked through. 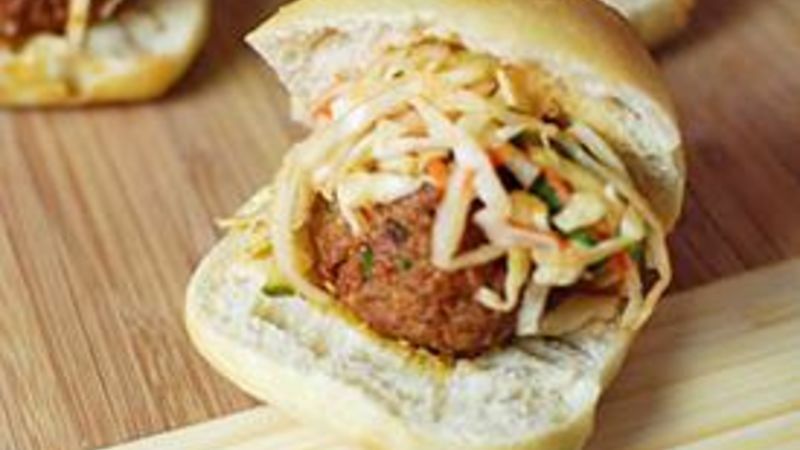 Assemble the sandwiches with one meatball and a nice amount of the pickled slaw and serve. I am on a quest to make a meatball from every part of the world. The most recent empty check box on this list was a Korean flavored meatball. 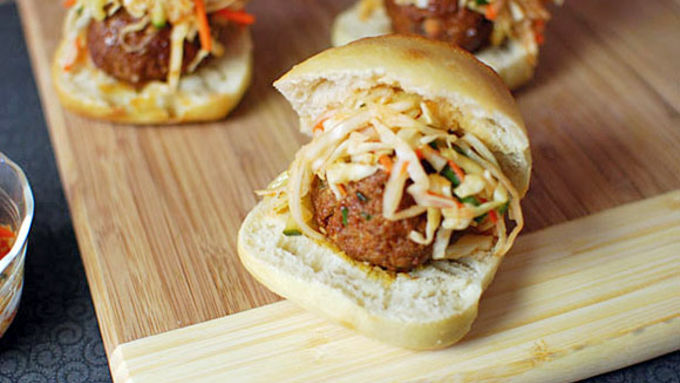 I thought these meatballs would be great as a slider with a quick kimchi-inspired slaw. My initial intention was to make this as a meatball sub, but something told me to make sliders and it was actually a good thing. That’s because my roommates all happened to be running around doing errands that day, and as each one left I handed them a slider. I didn't even say what it was. The next day when I saw everyone again, the general consensus was “I still don’t know what that was, but it was amazing”. These Korean Meatball Sliders are a big hit for people who love Korean food and people who have never even tried it! The kimchi slaw came out spicy, crunchy, and vinegary, a great accompaniment to the sweet and savory meatballs.